Since founding Window Well Experts in 1975, Joe Sikorski and his team have seen window wells of every shape, size and material. This deep knowledge of window wells goes into the products we make and sell, as well as the advice we give to homeowners and contractors. We sell window wells, covers and accessories across the U.S. and Canada, and we pride ourselves on ensuring that you have the well that best suits your basement and your specific needs. We offer a free estimate by phone or online, so reach out to us and discover how Window Well Experts can protect and beautify your house. Why Galvanized Steel or Composite Wells? At Window Well Experts, we specialize in manufacturing and selling galvanized steel window wells, as well as deluxe plastic/composite wells. These two types of window wells have a lot in common: both are lightweight, easy to install correctly, long-lasting, and due to material quality and single-piece construction, almost completely leak-proof. Combine them with a snug-fitting clear polycarbonate window well cover, and they’ll guard your windows and basement from rain, snow, ice, dirt, debris and vermin, keeping intruders out while making escape easy in emergencies. 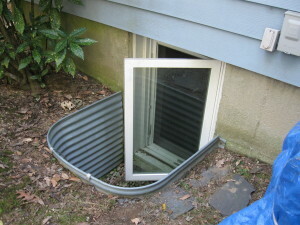 Other types of window wells come with their own common problems. Many materials used in well construction are not completely waterproof, resulting in cracks and other damage. Stacked stone, brick, lumber and cinder block wells are all prone to leakage, because unlike one-piece steel and composite wells, water and dirt can get through gaps between two pieces, or between the pieces and your wall. Concrete is complicated to install and repair, and it’s prone to cracks as the well and the house’s foundations settle. Many of these options are also hard to affix firmly to a window well cover, due to their uneven tops. Because we construct our wells ourselves at our factory in Delavan, Wisconsin, we know the excellent craftsmanship that goes into them. Moreover, we know how to match your basement and its windows to the exact well and cover you need, maximizing natural light while shielding your home from the elements. Big box hardware stores can’t match the standard of quality that our wells possess, and moreover, they can’t match our selection. Window Well Experts carries round, square and elongated window wells in dozens of heights, widths and projections, so you’ll always have a well that actually fits your house, and a cover that actually fits your well. If you need a non-standard size, we can even make you a well and cover to order. Building codes across the United States and Canada require egress windows and wells for any basement room used as a bedroom. These wells allow residents to escape the building in case of fire or other emergencies, while allowing rescue personnel a quick way into the basement. We have everything you need to make this potentially life-saving addition to your basement, including composite wells with built-in steps, galvanized steel egress well ladders, quick-release locks and hinges for well covers and grates, and many other products. Check with your local building inspection department to find out the specific egress well requirements where you live, and give us a call to see how we can help.